RIO GRANDE, Nicaragua - As a conscripted soldier during the Contra War of the 1980s, Esteban Ruiz used to flee from battles because he didn't want to have to kill anyone. But now, as the 47-year-old farmer prepares to fight for his land, Ruiz insists, "I'm not going to run." Ruiz's property on the banks of Nicaragua's Rio Grande sits in the path of a $50 billion transoceanic waterway set to break ground on Monday. Nicaraguan officials will start building access roads on state-owned land as the first step in creating a canal expected to rival that of Panama - a project supporters say will directly employ 50,000 people and dramatically boost the country's GDP. Farmers like Ruiz insist they'll fight "until the last breath" to protect their land. Whether or not landowners do actually take up arms, Nicaragua's government insists it is determined to push through. The project is slated to open a huge waterway over what is now the town of Rio Grande, an evangelical-dominated community of 2,000 people with only a dirt road amid fields of corn, beans, banana and sorghum. Everything within 6 miles would be subject to expropriation. 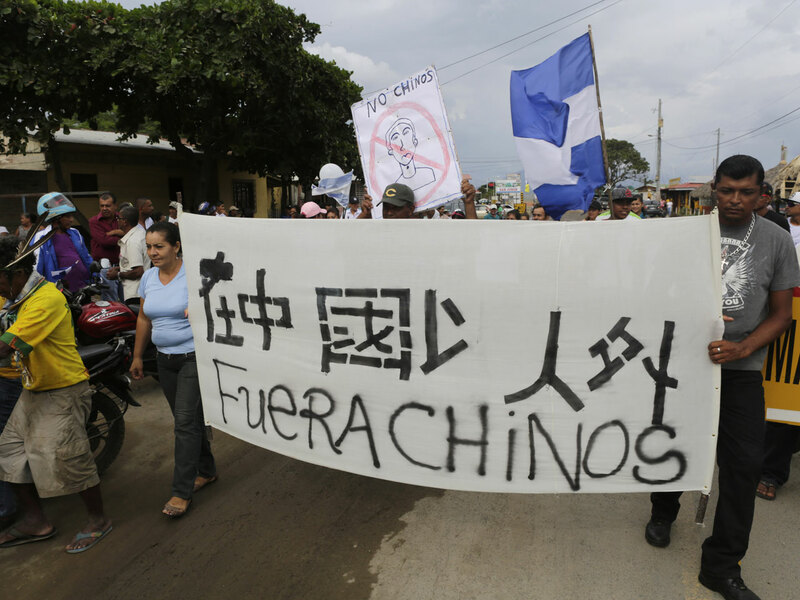 But the project, which opponents call President Daniel Ortega's pipe dream, is provoking growing anger. Many complain Ortega is giving too much away to HKND, the Hong Kong-based company set to develop and operate it. Landowners fear they'll be displaced without fair compensation. Environmentalists accuse the government of ram-rodding past mandated reviews and ignoring the threat that cargo traffic will pose to Lake Nicaragua, the country's main source of fresh water. Earlier this month, residents of Obrajuelo, a sleepy fishing village on the banks of Lake Nicaragua, threw stones at an SUV carrying a Chinese team that showed up to survey the land. The following day, they burned tires on the Pan-American highway, blocking it for hours. On Dec. 10, as many as 5,000 people marched through the capital, Managua. Even though protesters complained that police blocked canal-opponents trying to arrive from the countryside, observers said it was the largest anti-government action in years. Such political opposition is virtually unheard of in a country where Ortega's Sandinista party dominates all branches of government, and the president and his wife, the government's powerful communications chief, keep a tight lid on dissent. Projected to span some 173 miles between the Caribbean and the Pacific, the canal would be the realization of a dream that has been studied and discarded multiple times since the early 1800s. Backers say it would lift many out of poverty in the Western Hemisphere's second-poorest country. Last year, Ortega's allies in Congress fast-tracked legislation granting HKND a 50-year concession, renewable for another 50, to build and operate a canal in return for a payment of $10 million a year once it's up and running. The law lets HKND develop ancillary projects - ports, an airport, roads, a railway - even if it doesn't get built. HKND hired the respected U.K.-based consulting firm Environmental Resources Management about a year ago to assess the environmental and social impact of a project that is expected to displace some 29,000 people. In late July, just two weeks after HKND announced its preferred route for the canal, ERM held community meetings in seven cities over 10 days, according to a document on HKND's website. Some who attended the sessions left feeling they were merely being told what was going to happen rather than asked for input. Those who asked how much they would be paid for their lands were told only that officials would go door-to-door to inform them. "It was so they could say, 'We did the meetings,' " said Rosa Amelia Mora Novoa, a 37-year-old homemaker in Rio Grande who attended the session in Rivas, capital of the department of the same name. Late last month, HKND announced the environmental and social reports had been completed and found the impact would be minimal. The reports, however, have not been released for public review even as the day neared for the first turn of shovels. In a written response to questions from The Associated Press, HKND said the reports would be submitted for approval by the Canal Commission and the government in early 2015. A person with firsthand knowledge of the impact assessments, who lacked authorization to discuss the matter and spoke on condition of anonymity, said not enough time was allotted for proper study and consultation. "The studies are going to say that there are a number of things that need to be considered, and some of them simply can't be considered when you've already decided how everything's going to pan out and you've already started doing it," the person said. ERM declined to comment, saying it did not have its client's consent to do so. Nicaraguan ecologist Jaime Incer, who advises the government on environmental matters but opposes the canal, said of ERM: "They're letting themselves be used." He said it's impossible that the timeframe allowed for proper study of potential damage to things like biodiversity and water quality in Lake Nicaragua, coral reefs and animal migratory patterns. Telemaco Talavera, rector of the National Agrarian University and spokesman for Nicaragua's Canal Commission, said a number of changes were being made based on the studies' recommendations, such as relocating the planned Pacific port to protect mangroves and the entry to the Caribbean to protect indigenous villages and fish populations. Rather than dredge the lakebed to make it deep enough for large vessels, he said, the project will use machines to suction the soil in order to keep upturned sediment from clouding the water and shutting down photosynthesis. Talavera also rejected rumors that HKND will be allowed to run roughshod over property owners, promising that the Canal Commission will require the company to pay a fair price for land. The canal, which is projected to be fully operational by 2019, also has plenty of backers among Nicaraguans. "It's an initiative that should be supported," said Jose Marin Solano, a taxi driver in Managua. "Everything comes with sacrifice, and if it's for development and the good of the country, it should be done because otherwise we are going to remain in stagnation and poverty." Despite the lavish promises of the canal's backers, many remain unconvinced it will ever get built. Some point to Nicaragua's history of failing to come through on infrastructure projects, such as a joint mega-refinery project with Venezuela that was announced in 2007 but never realized. Moreover, it's not clear that the company has met its stated goal of raising some $8 billion in initial financing. Asked about investment, HKND said it has "received many contacts from the business sectors and will release (a) progress report at a proper time." In Obrajuelo, dozens of the 300 or so residents gathered on a recent afternoon to celebrate a girl's second birthday. A white bunny pinata hung from a rope in front of graffiti scrawled on homes by their very owners: "Ortega sellout"; "Chinese go away." Albalina Espinoza, 44, recalled how word spread like wildfire when the Chinese surveyors arrived to assess the land earlier this month. About 50 women from the village used rocks and sticks to smash the vehicle's windows before the workers fled; none were injured. She said Obrajuelo is prepared to prevent them from coming back, but declined to say how. "This," said 65-year-old Jose Jesus Vanegas Lopez, "is like a fight between a tied-up burro and a loose tiger."